How then can we sum up the situation of Catholicism at the end of the twentieth century, one marked by the immense and murderous catastrophes of two World Wars? It proved a bloodstained century, with 55 million being killed or starving to death during the Second World War (1939—45). One act of wilful murder stands out, the Shoah. Adolf Hitler (1889—1945) and his collaborators systematically exterminated nearly six million European Jews, one million of them children. Along with Nazism, the Communism of Joseph Stalin (1879-1953) and of Mao Tse-Tung (1893-1976) marked the century until, at least in Europe, this ideology officially ended when the Berlin Wall came down in November 1989. The sudden collapse of the Soviet Union was perhaps the most surprising event in the entire century. 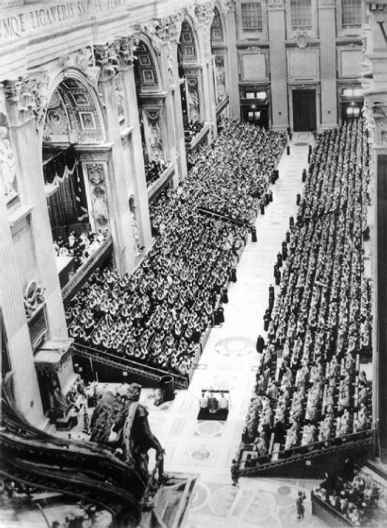 Dramatic changes affected the twentieth-century story of Catholicism. In 1900 almost two-thirds of the world's Catholics lived in Europe and North America; by 1993 three-quarters of them lived in Latin America, Africa, and Asia. An even more startling demographic change is the fact that, by the time the world population passed the 5 billion mark in October 1999, more than half the Catholics who have ever existed lived in the twentieth century. Another way of expressing the shift is to recall the conclave of cardinals who elected Paul VI (pope 1962-78); 65 per cent of those cardinals were Europeans and more than a third were Italians. By the time of the 1978 conclave that elected John Paul II, the Italian cardinals were down to a quarter and those from Western Europe down to less than a half. Beyond question, the Italians and Europeans were still over-represented in 1978. But a clear demographic change had begun in the college of cardinals, and it was no accident that in electing John Paul II, they chose the first non-Italian pope in more than four hundred years. He himself as a Polish bishop had attended Vatican II, the first Ecumenical Council to show the universality of the Catholic Church. Even so the Council manifested a trend rather than an achieved reality. For example, only 311 of the 2,600 Council Fathers came from Africa; of these 311, only 60 were Africans. Nevertheless, that Council revealed how, within the Catholic Church and beyond, the old days of European hegemony were drawing to a close. It is worth recalling how, when the Council opened in October 1962, the Cuban missile crisis had brought the USA and the Soviet Union to the brink of a nuclear war. John XXIII (pope 1958—63), who had called the Council, played a key role in defusing that crisis. A few months later he published his plea for a new world order, Pacem in Terris ('Peace on Earth). When he died in June 1963, some units of the Russian navy flew their flags at half-mast. In October 1965, a few weeks after the fourth session of the Council opened, Paul VI flew to New York to address a message of peace ('Never again war!') to the United Nations—being the first pope ever to speak to that body which represents the world. Popes John and Paul did their part in giving the Council a message for all humankind—something dramatically continued by Pope John Paul II. The Council had a double aim: an aggiornamento (updating) of the Church's own life, worship, and teaching; and new relationships with other Christian communities, with Jews, with Muslims, and with the members of other world religions. The first and last of the sixteen documents issued by the Council express the double aim. Through Sacrosanctum Concilium (4 December 1963) the bishops endorsed the reform of worship through (1) a return to earlier and simpler forms and (2) the use of the vernacular or local language. The last and longest conciliar text, Gaudium et Spes (7 December 1965), spelled out the bishops' ideals and values for Christian and human life towards the end of the second millennium. That same day Paul VI and the Orthodox patriarch of Constantinople issued a joint declaration, expressing their regret for nine centuries of division and hopes for future reconciliation. Through ceremonies held simultaneously in the Vatican and at the patriarch's residence in Istanbul they lifted the mutual excommunications between the Orthodox and the Catholic churches. The following day the Council, the greatest event in the lives of twentieth-century Catholics, ended with a solemn liturgy. On Vatican II see R. Latourelle (ed. ), Vatican II: Assessment and Perspectives , 3 vols. (Mahwah, NY: Paulist Press, 1989). ministry, and through other larger and smaller changes. Many of the new directions are reflected in the 1983 Code of Canon Law (for the Western Church) and the 1990 Code of Canons of the Oriental Churches (for the Eastern Church). The Council also opened the door to developments on a scale hardly imaginable to earlier Catholics. Let us mention a few examples. First, the papacy. By continuing and enormously expanding the practice of Paul VI, John Paul II made the papacy a world presence not least by visiting almost every major nation and many smaller nations around the globe. By April 2002 he had been out of Italy ninety-five times on 'apostolic pilgrimages', which often included stops in several countries. Second, since the closing of Vatican II in 1965, the Catholic Church has experienced the rise of Catholic feminism, the work of various liberation theologians (who frequently looked back to Las Casas for their inspiration), and fresh attempts at dialogue with the great religions of Asia. In the closing chapters of this book we will come back to these and other present trends and challenges. The opening chapters of this book inevitably tracked matters chronologically: the first millennium of Catholicism and then its second. The five chapters that follow will take up Catholic doctrinal teaching, using the general councils of the Church as major signposts. Here too we can present matters more or less chronologically. The main exception to a chronological order comes at once in Ch. 3: its account of Catholic understanding of revelation, the scriptures, and tradition will be heavily shaped by modern teaching. Chapter 4 presents the trinitarian and christological doctrines as substantially developed by the first seven councils (from Nicaea I in 325 to Nicaea II in 787). Chapters 5 and 6 examine Catholic teaching first on creation and human sin, and then on the new life of grace and glory—developed, in particular, by Augustine of Hippo (354—430), Thomas Aquinas, and the Council of Trent. Chapter 7 takes up the seven sacraments, which were in a special way expounded by the Council of Trent and the Second Vatican Council (with the subsequent liturgical changes it prompted). In Ch. 8 we turn to the Church, her structure, and her mission—major themes at Vatican I and Vatican II. We now summarize the Catholic understanding of divine revelation and its consequences in the inspired scriptures and living tradition. Let us once again insist that we will be setting out what is distinctively, but not necessarily uniquely, Catholic. All scripture is inspired by God and is useful for teaching, for reproof, for correction, and for training in righteousness. Before setting out any doctrines about God, human beings, the sacraments, the Church, and the rest, we must spell out the way Catholic teaching understands the divine revelation, the response of human faith, the tradition that hands on belief in God, and the scriptures that are inspired by the Holy Spirit. The interpretation of the foundational realities of revelation, faith, tradition, and scripture persistently shapes and colours the way particular doctrines are understood.